In the mapping interface, the menu presented below allows the users to interact with the elements on the map (background maps, thematic shapes or research layers). Whenever he wants, the user can display or hide the different elements using the chevrons. - Zoom back and forward. If the layer doesn't allow it, the icon is shaded. - Group or degroup the sites' icons on the map. By default, the icons are displayed in groups on the map in order to present more reliable and readable informations. The information is indeed more reliable this way because the superimposed sites can hide each other when the icons are degrouped. 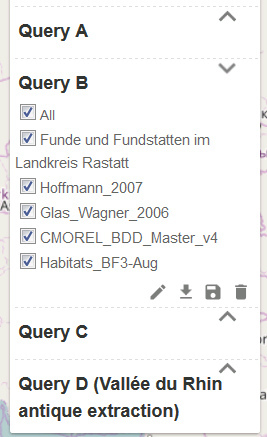 The user can choose the background map that is the most accurate for his query. Only one choice is possible. The layers selected by the user in his project are available in this menu. The user can choose to display them or not. Several shapes or layers can be displayed at the same time. On the illustration above, the layer "countries of the world" is selected. Each query with at least one site as a result will be displayed as a layer on ArkeoGIS. The user can choose to display or not those layers. It is also possible to display more than one layer at the same time. In this case, they will be superimposed by ArkeoGIS. The query and layer’s name are identical to the letter-icon on the map. If the layer comes from a saved query, this letter is followed by the name of the query. The databases listed on the layer are only those which correspond to the results of the query. - Credits for the background maps and layer displayed.